Dan Berry: This is Make It Then Tell Everybody. I’m Dan Berry. Jessica Abel and I sat down to talk about science fiction, editing anthologies and the new generation of narrative radio. This is Make It Then Tell Everybody. Hi, it’s Jessica Abel. Hello Jessica, how are you? JA: I’m good, how are you? DB: I’m pretty good. We met for the first time, I think in 2011 in Helsinki. JA: I can’t believe it was that long ago, but yeah. That’s absolutely right. You did not have a child yet. DB: I did not have a child. Now I have two. JA: You were on your way to having a child at that point. JA: I remember having an awesome time hanging out with you there, and it was a great trip, but it feels like it had to have been a lot more recent. DB: Yeah, it doesn’t feel like, what, nearly four years ago? JA: Yeah, at least! I can’t even count right now. Yes, about four years. Almost exactly I think, because it was in the wintertime. We went to Helsinki in the winter. It wasn’t the smartest travel plan, but that’s when they invited us. DB: The Baltic was frozen. JA: Yeah, and I loved actually learning about how the Finns, although it was the end of the winter, it wasn’t that bad, but how do they actually deal with winter. DB: They were walking around in shorts and t-shirts. DB: We’re not going to be able to stop it from snowing. JA: Right, so live with it! DB: Yeah, that was good. JA: I was impressed by that. DB: So this was a time where I didn’t have children and you didn’t have a book called Trish Trash either. I remember you talking about it, just at the beginning of talking about it then. JA: Yeah, I guess so. You know, I had just around then… I don’t know if I decided yet. It had originally been, the plan had been to write a script and collaborate with an artist, and I had decided some time around then to take it over and do it myself, for various complicated reasons that I won’t go into here. I hadn’t drawn my own comic… I hadn’t drawn a comic in several years before that, because I’d been working on my textbooks. So it was a pretty intimidating prospect to get into, but I was excited about it, and in fact it’s been a great experience. It’s been really fun to get back into it, especially since I have this great assistant who does backgrounds and stuff with me, and she’s amazing. This woman, she really likes drawing trucks, I mean, who likes drawing trucks, right? DB: You’ve got to keep her there! JA: She’ll draw space trucks so, I know. I know. She’s a keeper for sure. JA: My assistant is Lydia Roberts, and she is a former student of mine actually. So when I was gearing up to do this I thought, you know, I want to do this. I think it’s a good idea, but I am not prepared to also learn how to draw sci-fi trucks at the same time. That’s just not going to happen. So I cast it around in my mind, thought, ‘How am I going to do this?’ Having an assistant seemed the way to go, and Lydia just was an obvious choice. She’s amazing. She’s really, really good. DB: How does that relationship practically work then, because you’re in France at the moment. JA: I am! It’s been complicated. The first book, most of the first book… actually, all the first book was drawn while I was still in New York in 2012. I still had to do lots of clean up and stuff when I got to France, but the work on it was done. So it was easy, because she lives in New York, I lived in New York, and she would come over once a week and work in the studio. Otherwise she’d just take pages home and work at home, and we would trade stuff back and forth way too many times. ‘Can you finish this little detail,’ and, ‘How about this thing,’ and, ‘What do you think about that?’ ‘You need to redraw this,’ and, ‘Can you finish this so I can finish that?’ That kind of stuff, you know? But since I’ve lived in France, the whole second book we’ve done long distance. JA: So we developed a system that I think is actually a better system frankly. DB: Oh, does it keep you on the straight and narrow? JA: A little bit. Getting a little bit less fussy about stuff, which I think was also necessary because I had never drawn a sci-fi book either. I love sci-fi, but I did not fully grasp the difficulty of creating a sci-fi world, how hard it is. DB: How do you mean? JA: Everything’s up for grabs, right? Absolutely everything. JA: I mean, they’re humans, so not everything. They’re humans who come from Earth and relatively recently. It’s 200 years in the future basically. So they’re humans with human physiology and all that stuff, so that’s all not up for grabs. It takes place on Mars and on a Mars that’s pretty close to actual Mars, although I’ve chosen to not to grapple with the whole gravity issue, but lots of the other stuff I’ve dealt with. The fact that there’s no magnetosphere on Mars, so there’s a lot of cosmic radiation, that’s an issue. There are other things that are true about Mars that I’ve incorporated into the story. So all that stuff, those were basic facts I could deal with, but then beyond that it’s like, who are these people? When did they get there? Who are their antecedents and how does the society function? What are the rules? What do people wear? How does it work, like, how do they get from place to another? Do they go to school? Do they have paper? Do they eat food, like we think of food? Everything’s up for grabs beyond those basic facts. DB: And every one of those facts is a question and you’ve got to have the answer to it. JA: Exactly, and you have to think through all of those things. Then I also threw into the mix… spoiler alert… there are native Martians on Mars. JA: So then, that’s an entirely invented society, and I haven’t shown it very much yet. There isn’t much of it in the book, but it’s like, I have a lot of backstory, and that’s an enormous amount of writing and thinking. Then when it comes to the drawing side, it’s like, okay, well here’s a town. A grubby, outback town that she lives near, you know, she lives outside of. What does it look like? What’s the architecture like, you know? There’s the basic idea that they don’t have a lot of money, so there’s not big elegant buildings there, but are they squarish or roundish, or are they built with metal, or cement, or mud, or an advanced polymer, or who knows what, right? JA: My notion too is that many of the people who landed, they came on some kind of… the early people came on landers and they’re these tubular metal things around that have been sold and resold on the Mars Craigslist. JA: They’re sitting around. Writing sci-fi is complicated, you know? It’s really complicated, and all of those things have repercussions. DB: You mentioned that this is the first sci-fi book you did. Were you into sci-fi when you were younger? JA: Yeah, always. I’ve loved it always, yeah. DB: So, how come you haven’t done more sci-fi now? What was your entry point into comics then? JA: I don’t know. How can I get into this? When I was a little kid, like a pre-teen, teenager, I read a lot of sci-fi, read a lot of sci-fi novels. There were several ways that I would do that. Through the library I would get bunches of stuff. I remember tearing through the entire Dune series, like all eight or ten or whatever zillion pages in Dune from the school library. I would go in during lunch and read them there. There were also some used bookstores that I used to go to where I’d buy a grocery sack of sci-fi novels and just read through them. It’s funny because I don’t remember… and I would do it in a couple weeks. I would just get in my bed, and just sit there and read, and I had this thing of like, my mom could yell for dinner next to my head and I wouldn’t hear her. JA: Yeah, very involved. The comics thread is kind of a separate thread for me in a way, because I grew reading comics whenever I could get my hands on them, but generally speaking I kind of depended on other people to put them in my way, if that makes any sense. DB: Yeah. So they weren’t something you went and actively sought. Was it that there wasn’t somewhere to go, or you didn’t know where to go? JA: Yes, both. Also I didn’t have any money. DB: Well, that won’t help. JA: Yeah, none of those things were in line. It just also never occurred to me that one could go to a store and buy a comic book. DB: Yeah, no I thought about this before as well. I remember thinking that… I never really understood that comics were something that was made when I was a kid. I never really understood that someone would sit there and think about it and then draw it, and then it would get sent off to a printer’s and turned into a book. Comics were just something that existed. JA: I know, I totally remember that feeling, but that’s not really what I’m talking about. I’m talking about literally going to get books, like if I were going to go get a book. I wouldn’t go get a comic book. I didn’t know, I never saw them in stores really. Maybe there was a spinner rack around somewhere, but I just… it never occurred to me you could go to a store and buy a comic book. People had them in their houses, and if they had them I would read them avidly. I had a stepbrother, my mom was remarried for a period of several years and my stepbrother had a trunk full of comics, and I know that among the comics he had, and this was in the mid ‘80s, were all the Frank Miller Daredevil and Elektra comics. So I read all those things, but I read them when my stepbrother felt kind. JA: You know? And would let me read them. I’m exaggerating a little bit, because the one place I would get my own comics, I would have comics bought for me, was when I went with a friend of mine, I grew up in Chicago. My friend, her parents had a boat in Michigan, which is just around… it’s a four hour drive from Chicago around the south end of the lake. So we had these long drives. She would bring me up as her pal and we would have an overnight on the boat. They would buy us, in a gas station on the way, they’d buy us each one three-pack of… I don’t even remember the brand, you know, like Richie Rich comics. JA: Kids’ comics, and I would tear through all of those and be done in 15 minutes and want more. DB: Did you always draw at the same time then? JA: Yeah, I liked to draw and stuff, but I never identified myself particularly as like, ‘I am the artiste’, or something like that. I didn’t take a lot of classes. I didn’t pursue it that much. DB: Did you have an art training then? JA: A little bit later on, but not really, no. So anyways, I’m being way too wordy about this, but the main thing is that I grew up thinking that comics is one kind of thing, and sci-fi as being this other kind of thing. When I was in high school I got a job, and I bought comics finally. I was buying X-Men and Elfquest and stuff like that. So that’s sci-fi, but I didn’t think of it as sci-fi because it felt like a whole different category of things. So somehow the idea of what I’m doing now feels like basically a sci-fi novel, and that’s the feeling I have about it. I never read that many comics that were like that, you know? JA: I think when I started doing comics, when I got into comics, I was also deep in my punk rock phase and all that stuff, and I think for very honest and true reasons, it’s still a right, I fell for Love and Rockets and Jimbo and a bunch of other really hard hitting black and white comics, and that’s the way I went. It seems like an obvious thing to do when you’re basically… I was at college then and it was a high-end liberal arts college and I was an English major. You know, it fits with your self image as a… and this is going to sound like I’m running these things down, like, ‘Oh, they’re so elitist,’ or whatever, which they totally aren’t. I don’t mean to say that, but they’re one way of approaching art. This other thing that I’ve always been interested in, of spinning really large tales of stuff, really involved stories about things that are slightly fantastical, there are a lot of people who look at that and think that’s not at the same level, you know? And I was one of those people, I think, to a certain extent. DB: Why do you think that is? JA: Boy, I don’t know. That’s a big question. JA: No, I don’t know. I mean, I do think that plenty of genre fiction is crappy. JA: You know, enjoyable but crappy. There’s nothing that requires genre fiction to be crappy, but if you look at the preponderance… the emphasis is the story, the emphasis is weaving these masterful tales and these characters and building these worlds and stuff, and it’s not the subtle character studies or oblique looks at the world we live in. You know what I mean? You go in it, rather than… that’s what readers want, you know? JA: I mean, the stuff I like the best, it brings those two things together. DB: Yeah, I agree. I think the best sci-fi and the best fantasy isn’t really about the sci-fi and fantasy. It’s about us, isn’t it? JA: Right, well it’s all about us. All of it, even the bad stuff, but yeah, the bad stuff may not have all that much to say. I was reading some stuff recently, and you know what, I watch TV. I don’t watch TV all the time, but the TV I watch often, if there’s a new sci-fi series on, I am a sucker, I will watch it. JA: Yeah, totally. Sci-fi, hour long drama, I am so there. You know, a lot of them are totally… they’re crap. I totally will watch them anyway, but they are crappy. They think that they’re getting into something deep, but basically it’s very naval gazing. And I’ve been reading a bunch… I’ve read sci-fi more recently and some of it I’ve enjoyed a lot, and there’s some really great things about it, but there’s this weakness which is to be florid. You know, these long descriptions of stuff. Pages long description of the canyon they’re walking through, which you’re like, you know, it’s not the point. DB: That’s not what we came here for. JA: Right. Not why I came here. It’s obviously what some people come here for. DB: Yeah, listen canyon fans out there. JA: You know what I mean, canyons on Venus. JA: Anyway, I’ve felt as somebody who… I have a lit degree, an English degree from the University of Chicago and my mom is a writer and editor and my dad is a literary agent, I come from this very dedicated literary background, and there’s an instinct in me to reject genre fiction, even though I enjoy it so much, be like, ‘Yeah, you know, it’s garbage. I like it, but it’s garbage,’ you know? DB: Yeah, there’s always a ‘but’. DB: Yeah, you’re not coming in as an imposter. JA: Right. I mean, I love this stuff, and I’ve always loved it. My whole life I’ve read this stuff. I am not an expert, I will never claim that but I like it. I’m not dabbling. DB: That makes sense to me. When did you first start drawing with any real direction then? JA: In school, I was always the kid who like, I could draw well, but for some reason that never translated into, ‘and I should go to art school’ or something. Which is fine, I didn’t and that’s totally okay. But when I was in college I started taking a bunch of classes. I didn’t minor in art or anything like that, but I took a lot of classes in art. You know, drawing and I’d usually have one to two classes a semester that were visual art, and started making comics basically on my own, self-taught. DB: I’m always really interested in this jump that people made into drawing their own. JA: Well, it was Love and Rockets completely. Totally, it was like, I was drawing stuff, clipping and saving bits of comics. Not clipping, but you know, photocopying and clipping and saving bits of pictures I liked and drawing things and whatever, but when I read Love and Rockets it spoke to me on a super deep level. Like, this is the life I would like to lead, and I want more stories about this, and if there aren’t going to be a lot more volume from Jaime then I need to actually step up and draw some. DB: [laughs] I need to fill the gap in this market! JA: A bunch of people need to be doing these stories, because just one guy, even though he’s the most amazing, there’s not enough of them. DB: It’s never going to be enough. JA: You know, I don’t know, I’m being cheeky, but you know what I mean. I felt like, ‘This is something that really speaks to me, the person I am and the life that I lead, and my friends.’ It felt really important, you know? JA: And very soon after reading that I did my first comic. DB: What was your first comic then? JA: Let’s see, my very first comic was something I did for a class, to get out of writing a paper. DB: [laughs] I mean, that’s the way everyone gets started really. JA: It was me, at least twice! JA: Yeah. What’s funny is it was the same thing, in two different schools, two different classes I drew a version of Medea, and in both cases I got an A, and in both cases I had absolutely nothing to add to the critical dialogue about the play. JA: [laughs] Yeah! I mean, they were smart people. It’s not like I was fooling them, but… yeah, they graded me on a curve I guess. DB: Nice, it worked out in your favour. JA: I drew a space Medea. The first comic was a sci-fi comic. It flashed back and forth. I don’t have it anymore by the way, I don’t know where it is. I sort of wish I could find it, and I’m also glad I can’t, but it was a space Medea where it would flash back and forth between ancient Greece and a space station. In the end Medea kicks her kids out an airlock. JA: My roots are deep, like I told you. Literature, and sci-fi. DB: Nice! So how did you then make the jump from doing these comics for classes into turning it into… because you were self-publishing weren’t you? JA: Yeah, quarterly anthology, and they did one and then just all fell apart. DB: It’s a lot of work. DB: ‘I have nothing left to prove.’ Yeah. JA: So the next year I took it over, like, I became the editor. So there was only one the first year, and then the next year I did three, and because I wasn’t really friends with these guys, we were friendly but it’s not like I would hang out with them, and also because I was an idiot, I essentially did it basically all by myself. JA: Yeah. A strong basis for continuing on to do self-publishing later. So later I did Artbabe after I graduated college, and that was photocopied and scamming photocopies off my friend’s job, or whatever, but I had already done the more professional version before that. DB: Oh I see, okay. JA: If you see what I mean. I’d already picked up boxes of stuff from a printer and all that stuff. DB: Wow. That experience must have held you in good stead, because you worked as an editor and you’ve worked with anthologies since then. JA: A little bit. Not very much. JA: Yeah, I really haven’t done that much of being an editor. Just only The Best American, but that’s a completely different type of job. DB: Explain what that is then. JA: Well, for six years Matt and I were the series editors for The Best American Comics, and we stopped… our last one was 2013 I think. DB: I was going to say last year, but it’s not anymore, is it? It’s January now. JA: It was not this last one. It’s not that I don’t remember which one it was, but I don’t remember what they call it, because it’s all off, the time, you know? The books are from 2012, but I’m pretty sure it was the one that came out in 2013, was our last one. DB: Yeah, I think you’re right there. Can I ask a dumb question? JA: Matt is my husband. JA: Yes, and he’s Matt Madden, the incredibly famous experimental cartoonist. Don’t you know? DB: Of course, this is a character that I play, of course. JA: I’m just teasing you. JA: Doesn’t everybody know? I just say, ‘Matt.’ Like, who else could it be? JA: To be series editor means to be responsible for finding the material that goes into the books, and goes to the guest editors to choose from. Does that make sense? JA: Our top picks, yeah. We would send them 100 to 120 things. DB: That sounds like an awful lot of work. JA: There’s something like, I don’t know what, 7,000 things that come out in the Americas in a given year. An enormous number, and we wouldn’t see anything near that. We logged everything that came in, and we would log 800 pieces. DB: Whoa, geeze, that’s an incredible amount of things to read. JA: Yeah, it was huge. I was glad to close that chapter. DB: Sure! Did you close this chapter by moving to France for a while? DB: That was the way you did it. JA: We could have worked something out if we wanted to probably, I mean, they didn’t tell us, ‘Let’s close this chapter,’ you know? But one of the things we were doing when we moved to France was trying to simplify our lives so we could try to get more comics done. Best American was one of the things that stood in the way of that for sure. We had a run there of doing really interesting, complicated jobs of various kinds, all related to comics, and mostly prevented us from making comics. DB: Too much comics to make comics. JA: Kinda, yeah. I mean, you know what that’s like, I’m sure. DB: Sure, yeah absolutely. They’re time consuming. I think when you work with comics and you work with something else as well, you get a really good sense of how long an hour is. And each of your hours becomes precious! DB: So what are you doing in France then? Whereabouts in France are you? DB: Nice. Of course, home of the Festival. JA: Home of the Festival, which is this week. You know, it’s a small city in South West France that’s about two thirds of the way to Bordeaux from Paris, along that road. You know, Angoulême is well known for comics and BD, but it also has, not only is it well known for that, it also has… I mean, they’re totally intertwined, I’m making this like it’s two different things, but there’s a structure in place, civic support for comics and stuff. There’s an organisation called Magelis that started the Maison des Auteurs. I’ve heard recently they had a whole different plan for it when it first started, but anyway, it ended up being a residency for cartoonists and animators. JA: It’s pretty nice, and it’s run by La Cité de la bande dessinée et de l’image, so that’s what we’re doing. The first year we were here we came as… we had housing. They have some apartments available, but not for everybody who comes, but for a certain proportion of people, but you can only have it for a year. So we’ve been here for now two and a half years, so the first year we were in one of their apartments, and then we moved from down the street to our own place. We’ll be here probably four years. DB: Four more years or four years total? DB: Wow. That’s pretty good. JA: Yeah, you know. I mean, I miss New York these days a little bit. DB: I mean, it’s a big leap, New York to Angoulême. JA: Yeah, I didn’t miss it at first. I was like, good riddance. My life was just so complicated and I just needed to breathe a little bit, you know? But after two and a half years of nonstop labour on these two books, I just… you know, it’d be nice to leave the house sometimes, like, not be in the studio. That would be nice. JA: I look forward to that, to having that life again, when that sometimes happens. DB: Nice. I’m sure that must be lovely for people who get to go outside. JA: I know! I hear about it, it sounds great. DB: Apparently. You know, there’s natural light and things like that. DB: I’m sure we could learn to live with it. DB: [laughs] So you mentioned you did some educational books with Matt, so this is the Drawing Words and Writing Pictures. JA: Right, so this is a big project we did over a period of about six years while we were living in New York. We had been teaching for a number of years already at the School of Visual Arts and teaching comics there, and you know, a bunch of factors came together and made us feel like it was really… it was time to do it. There was a gap, there was a need for a textbook, a need for somebody to codify some of the things about how you learn comics, and so we did that. It was a really big project that I’m still… I’m really proud of it. I don’t have any sense right now of how it… how that whole filling the gap concept actually played out. Like if anybody… if it’s being found in the way that I wish it were, I don’t know. I’m not sure about that. Yeah, so there are two books and a website filled with lots of stuff. DB: Yeah, it’s an excellent resource. JA: Do your students get it? Do they like it? DB: I tell them to like it. JA: [laughs] Of course they obey! DB: Of course, but then you’ve got to remember, I’m the teacher and I’m not cool. JA: I mean, I don’t know about that. I think my students usually thought I was reasonably cool. I mean, not like ‘let’s hang out together’ cool, but like, ‘I want to know what you know’ cool. DB: I’m slowly realising the older I get that I am way less cool than I actually think I am. DB: Yeah, you know, I’m okay with that. I don’t try and be cool anymore. JA: That’s a help, that’s always good. DB: First step into becoming truly cool is to let the cool go. DB: That’s what someone who is deeply uncool would say, I’m sure. DB: That easiness that comes with just letting it all go. Yeah. I’ll steal that. I’m going to use that. JA: Use it, yeah. All yours. DB: [laughs] Excellent. So, what is next on the cards for you then? So you’re working on a book right now. DB: Like, imminently, the end is coming on this book? JA: Yes. So I’m working on a book right now called Out on the Wire: Uncovering the Secrets of Radio’s New Masters of Story with Ira Glass. DB: This isn’t the first time you’ve worked with Ira Glass. JA: No, and it really feeds off that previous book. So I did a book in 1999 with him. DB: This was the first time I came across your work actually. JA: Oh really? Interesting. How did you find that? DB: I can’t remember. It feels like an awful long time ago now. JA: It was a long time ago! I’m drawing myself again, and drawing Ira and we’re a lot older, I have to say. DB: I remember. Now when was this… this would have been, I think 2000-ish, or thereabouts. JA: And you’re in Wales, right? DB: Yes, I was just on the border of Wales in England. JA: So, not likely that you’re going to run across it. DB: No, we don’t have WNYC. It doesn’t reach that far. So I found this radio show and I really, really liked it. I devoured everything I could find, and then I was just searching… was there an Amazon back then? I can’t remember, but really searching it out, and I found your book and I remember really, really liking it. DB: Yeah, it gave you an insight into how to craft a story. JA: Yeah, and that’s really what this is all about for me. Like, that’s still… that’s why I’m doing it again, you know? It’s because I felt like there’s a lot more to say about what these guys do. The book, it’s called Radio: An Illustrated Guide, the original book, the one you’re talking about. So I did that in ’99, and that’s just a 30 page pamphlet book. It’s a comic book, and this new one is a 200 page tome about radio storytelling. And really, like, trying to get into… because the first one was like, how does This American Life make their show? What are the stages of, you know, you record tape, this interview, you write, blah, blah, blah, and in fact I’m including as a part of the preface, a large excerpt from the book. The majority of that book will be in the new book, because all that stuff still holds. It’s still true. DB: I mean, we don’t record to tape, but every other principal is the same isn’t it? JA: It’s not actually tape, but they still call it tape. JA: No, it’s not actually tape, but it doesn’t make any difference really. It’s just a slight difference of technology. We were already doing digital editing then. It wasn’t as good, but that’s what they did, you know? It’s just the same thing, but that doesn’t cover it. So you can do a great interview and know how to edit it and stuff, but if you’re not really thinking through, like, what is the story you want to tell, you’re not going to be getting there. So the new book is about, not just This American Life, because it’s really not very much about This American Life, except in the sense that the older stuff is still there. Instead it’s about a bunch of newer shows that follow on This American Life, not to say that they’re copycats, but they’re inheritors, let’s say. DB: Yeah, narrative storytelling through interviews and artful editing. JA: Yeah, and music, and sound, and yeah, all that stuff. DB: I love that stuff. JA: Oh, good! You’ll like it then. DB: Yeah, looking forward to it! JA: I feature RadioLab, Snap Judgement, Planet Money, The Moth, Radio Diaries, 99% Invisible. DB: Oh yeah, oh yeah! JA: Yeah, the book is about how these radio producers conceive of narrative, and how do they craft the narrative? How do they think through before they even get into the story in the first place, before they even pitch it, how do they figure out what the real idea of the story is, and what’s going to be a compelling idea for the story? How do they find good characters? How do they then create a structure for a story that’s going to be compelling? DB: Well, one of the questions I have about that then, is how do you talk about something that’s entirely auditory in something that is entirely not? JA: Well, you’ve read the book, and I think that it seems like it’s going to be totally illogical, and yet it just works. There are definitely moments where I can’t evoke or replicate well what it is that they’re trying to do. You know, there are certain techniques… and this is one of the things I tried to do in the first comic too, is I try to mirror a little bit what they do in comics. DB: Oh, so the storytelling style? JA: No, I make metaphors, like visual metaphors for what they’re doing. DB: Okay, yeah that makes sense. JA: There are certain things like with voice for example. It’s the one thing that they talk about all the time, like capturing authentic voice and stuff. There are things that comics can do that straight prose can’t do, like creating rhythms with word balloons, or empty word balloons, or panels with no sound in them, or whatever, they can evoke that feeling, and you hear it a little bit. Now obviously music and sound, that’s the chapter that’s complicated, but what I chose to do with that chapter… and of course there’s music and sound throughout all the stories, and I just ignore the fact… you know, I’m just not talking about it. JA: But in the chapter where I’m specifically talking about it, obviously I’m talking about it, and what I chose to do with that in that case was to make it much more visual. Change the style a little bit and make the images take over the role of the music, so that there’s a, kind of, immersion that music and sound can create. But it is challenging for sure, to think about, ‘How can I evoke this thing that’s sound based and voice based?’ I feel like the writing style is not that dissimilar from comics to radio, the need for compression, using dialogue much more than narration and depending on dialogue and voice. Those things are very native to comics, and I think it’s a good match. DB: Yeah, I agree. Interesting. So when is this being finished then? JA: Yeah, so it goes to the printer, like, I don’t know, three or four weeks after I turn it in. DB: Whoa. That’s pretty rapid. JA: It’s extremely rapid, and a little bit scary, yeah. DB: But you’ve got the experience, you know what you’re doing. JA: That doesn’t mean it’s not a little bit scary. DB: [laughs] I have every faith in you. JA: So anyway that’s August, mid August 2015. JA: It’s an imprint of Random House. DB: This weekend, if you’re listening to this podcast on the day of release and you happen to be in Angoulême, people can come and say hello at the Festival. JA: Yeah, absolutely. That’s not for this book though, that’s for Trish Trash. 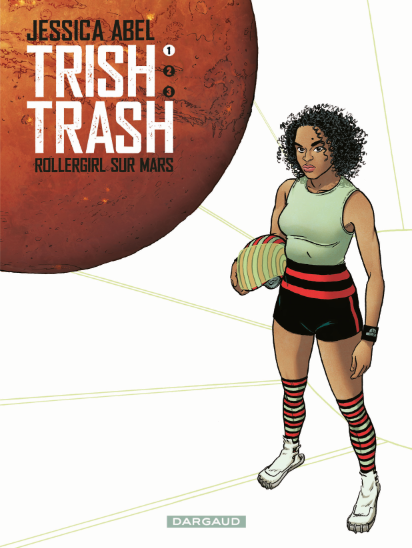 Trish Trash is coming out… officially it comes out on Saturday, the 30th of January 2015. JA: Yeah, long time coming. Oh my god, I’ve been working on this book for eight years. DB: So, if people want to find out more about you, or buy some books, or whatever it is, what do you want them to do right now? JA: Well, buying books is complicated. If you want to buy a book in French, you can buy them via amazon.fr or fnac.com. You can Trish Trash now, and I have… for English speakers I’ve posted the transcription of the script on my site. DB: So this is only published in French at the moment. DB: Is it very different? JA: Yeah. I mean, you know, it’s recognisable, but yeah, it’s pretty different. JA: Just in terms of priorities and stuff. I haven’t been all the way through the process yet, so I don’t even want to commit myself to anything, but what it feels like is that they’re much less willing to burden authors with creating ancillary stuff. You know what I mean? Which is good and bad, because I certainly do not need to be more burdened, but on the other hand I’m like, ‘I can help! I can do something.’ And it’s really hard to get through, like, ‘I really do want to help, so that I make this work right.’ So there’s a little bit of style difference there, and my editor is just as overworked as every editor I’ve ever worked with. Maybe more so. JA: So, that’s the same, and he’s a good friend and I really love him, but he’s really hard to get in touch with on a professional level. So that’s been a drag, but I feel like they… I’m working with Dargaud, which is a big house. DB: Yeah, they’re one of the big ones, aren’t they? JA: They’re one of the big ones, and they don’t put out a zillion books, but they put out some of the most visible, high profile books. And I feel like I’m in that machine, you know, which is good and interesting. I don’t feel like I’m being ground up by the machine, but it is carrying me along with it, and the book hasn’t come out yet, so I don’t know what’s going to happen. I don’t know if it’s going to work or not, you know what I mean? There’s a whole machine, there’s a whole things that happens, but it’s like, will it actually sell because of this, or will it not? I don’t know. It’s very mysterious to me. DB: Wow. So, if anyone is in Angoulême go and buy it. JA: Yeah, the euro is in the toilet, so come on over. Buy lots! DB: [laughs] Yeah! Take that euro! Oh boy. JA: Come in with dollars. I don’t know what the pound is doing right now, relative to the euro, but the dollar is like, it’s never been this strong in comparison with the euro. It’s amazing. DB: That’s reason enough in my book. JA: There you go. Get on a plane. Let’s go. JA: Well, jessicaabel.com is the portal through which you can find all the things. There’s not a lot you can actually buy right now, other than a French book, but pretty soon you’ll be able to pre-order Out on the Wire. It’s already on Amazon with a completely ugly temporary cover. JA: But pretty soon it’ll be the real cover, and you know, there will be a real description. DB: And people will jump up and down on it, I’m sure. JA: We’ll see, we’ll see. I’m excited about it. I think it’s going to be fun. It’s going to be really fun, I think, to go out with this book, because I feel like, you know, with the whole podcasting moment that’s going on right now, it is interesting. It is interesting out there when it comes to narrative audio. DB: Absolutely, I love it. I genuinely love it. JA: You’re part of it! JA: Well, you’re in a different wing of it. You do a very good job, like, the thing you do. JA: It’s the less edited, less structured… you know. JA: Conversational, which I love too. DB: Friendly, warm. Less sterile, you know. Some people say much better, I think, you know. DB: [laughs] Yeah, something like that. DB: Thank you so much. Jessica, thank you very much to speaking to me. JA: It’s been great to talk to you.